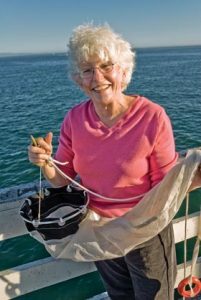 We present a conversation with Dr. Mary Wilcox Silver,Professor Emeritus of Ocean Sciences, one of the first women to head a major Ocean Sciences department at a UC. Her works focuses on phytoplankton and ocean food webs. What do phytoplankton have to do with Alfred Hitchcock’s movie, The Birds? Find out how Mary Silver figured out the answer!